I have finished my PhD in which I explored different usability issues that affect usefulness of Handheld Augmented Reality (AR) systems. The motivation to dig into this research area comes from my perception of life. I see the environment we live in as a fascinating place filled with countless interesting objects and people. This vibrant space is possibly the richest source of visual, audio and tactile stimuli that fabricates our everyday life experiences. Yet, we spend more time than ever interacting within digital media confined to screens, which often serve to disconnect us from the physical space we live in. How can we escape from the glow of the screen and bring digital and physical worlds together and how can we make the world itself a user interface for digital interactions ( Höllerer & Feiner 2004; Wellner et al. 1993)? The answer is obvious: AUGMENTED REALITY. During my 4 years at Lancaster University I managed to publish at top ranking conferences such as CHI, ISMAR, ICMI and MobileHCI (Google Scholar). I now co-direct HCIUP Lab - Humans Interacting with Computers @ University of Primorska. HICUP is laboratory at Faculty of Mathematics, Natural Sciences and Information Technologies (FAMNIT) where I continue my research in the field of Augmented Reality and Human Computer Interaction. If you want to join me and my friends, I am more than willing to collaborate :). For up to date info follow me on Twitter or LinkedIn. We build fun user experiences for mobile and web, which amongst other, utilise novel interaction concepts such as Augmented Reality. The products tackle a wide range of application domains, such as: advertising, e-commerce, the social media and more. 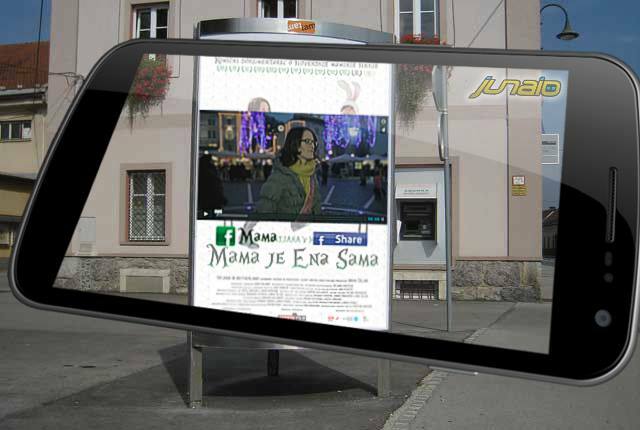 AR marketing campaign for documentary Tatjana in Motherland utilising Mobile Augmented Reality. The user needs to point the phone at the poster and the poster springs to life revealing hidden content such as movie trailer and standard social media interaction elements. Plan the layout of your room and interactively scale your wall stickers in place. Dynamically resize your wall art in proportion to the scale of furniture around your home. See how the design looks in any room of your house. Now you no longer have to guess at how wall art from The Binary Box is going to look in your home! The Wall Sticker Room Planner will do all of the planning for you with minimal guidance from you the customer. We have been hard at work creating the perfect app to show you exactly how any of our products will look so we hope you enjoy. My role on the project was to support the design process, build the soulution and release it on Google Play. Taking the Artwork Home project uses Mobile Augmented Reality (MAR) to allow people to digitally curate their own art exhibitions from their own homes using content from the Peter Scott Gallery at Lancaster University, and juxtapose this with their own media. Using this novel approach, the aims of the project are to discover new curatorial strategies; to uncover community identities; to enhance access & participation in the arts; and to inform events programming, tourism and business in new ways. My role on the project was to collaborate with all involved and provide technical expertise in AR in order to: (a) support the design process, (b) build a working solution in collaboration with other developers, (c) release software (Google Play). In this project we explore how Augmented Reality can be utilized as a crafting tool for building real world objects. In this early work we explore how novice users can be supported in creating physical sketches through virtual tracing, i.e. creating a physical sketch on paper given a virtual image on the handheld device. In order to address the challenge of pose tracking while mitigating the effects on virtual tracing we utilize Dual Camera Magic Lens where we use the front facing camera for tracking while the back camera concurrently provides the view of the scene. 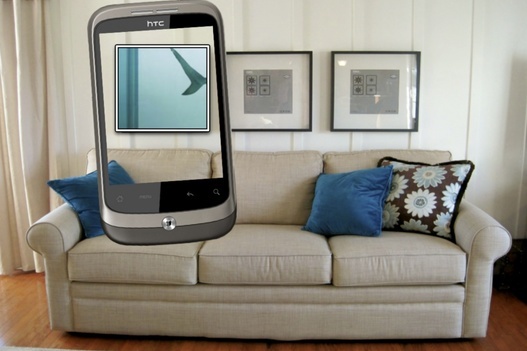 The magic lens paradigm, a commonly used descriptor for handheld Augmented Reality (AR), presents the user with dual views: the augmented view (magic lens) that appears on the device, and the real view of the surroundings (what the user can see around the perimeter of the device). Unfortunately, in common AR implementations these two do not match. In this project we uncover how this mismatch affects the users. Čopič Pucihar, K., Coulton, P., & Alexander, J. (2013, December). 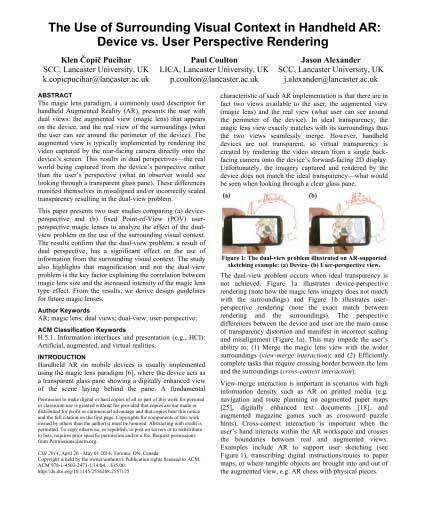 Evaluating dual-view perceptual issues in handheld augmented reality: device vs. user perspective rendering. In Proceedings of the 15th ACM on International conference on multimodal interaction (pp. 381-388). ACM. Čopič Pucihar, K., Coulton, P., & Alexander, J. (2014, April). 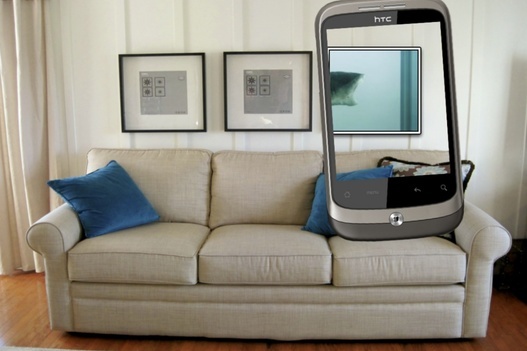 The use of surrounding visual context in handheld AR: device vs. user perspective rendering. In Proceedings of the 32nd annual ACM conference on Human factors in computing systems (pp. 197-206). ACM. 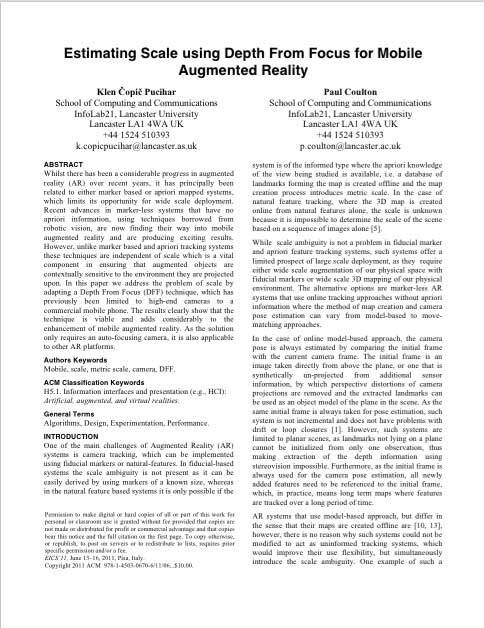 Previous studies identified shortcomings of the magic lens interaction paradigm that range from poor information browsing task performance to undesired effect of the dual-view problem degrading user’s ability to relate augmented content to the real world and users’ ability to use the existing contextual information. In this project we explore how a hybrid magic lens approach could improve such interaction. In other words, how designing a magic lens with more than one view can benefit the user. Čopič Pucihar, K. , & Coulton, P. (2014, September). Utilizing contact-view as an augmented reality authoring method for printed document annotation. In Mixed and Augmented Reality (ISMAR), 2014 IEEE International Symposium on (pp. 299-300). IEEE. Čopič Pucihar, K., & Coulton, P. (2014, September). Contact-view: A magic-lens paradigm designed to solve the dual-view problem. In Mixed and Augmented Reality (ISMAR), 2014 IEEE International Symposium on (pp. 297-298). IEEE. In this project we looked at different ways of imporving virtual transparency of the Magic Lens. We looked at how to improve depth perception when looking through the magic lens utilizing paralax berrier stereoscopic displays and how to improve scene readability utilizing high resolution textures. Čopič Pucihar, Klen, and Paul Coulton. "Enhanced virtual transparency in handheld ar: digital magnifying glass." Proceedings of the 15th international conference on Human-computer interaction with mobile devices and services. ACM, 2013. Čopič Pucihar, Klen, Paul Coulton, and Jason Alexander. "Creating a stereoscopic magic-lens to improve depth perception in handheld augmented reality." Proceedings of the 15th international conference on Human-computer interaction with mobile devices and services. ACM, 2013. 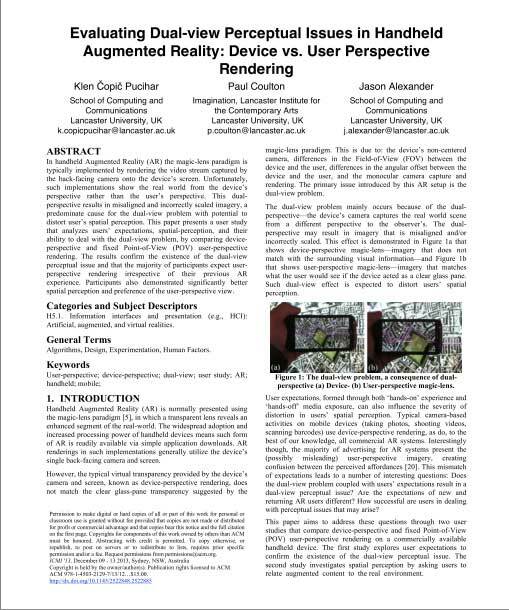 In this project we looked at different ways of imporving the context of augmentation in handheld AR. We looked at the possiblity of introducing scale utilizing autofocusing capability of the camera phone and the depth-from-focus technique. We also looked at how one can simplify initalization of planar maps utilizing on device accleorometers. Čopič Pucihar, K., & Coulton, P. (2011, June). 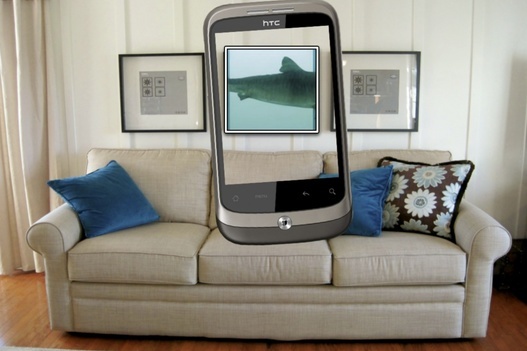 Estimating scale using depth from focus for mobile augmented reality. In Proceedings of the 3rd ACM SIGCHI symposium on Engineering interactive computing systems (pp. 253-258). ACM. Čopič Pucihar, K., Coulton, P., & Hutchinson, D. (2011, August). Utilizing sensor fusion in markerless mobile augmented reality. In Proceedings of the 13th International Conference on Human Computer Interaction with Mobile Devices and Services (pp. 663-666). ACM. 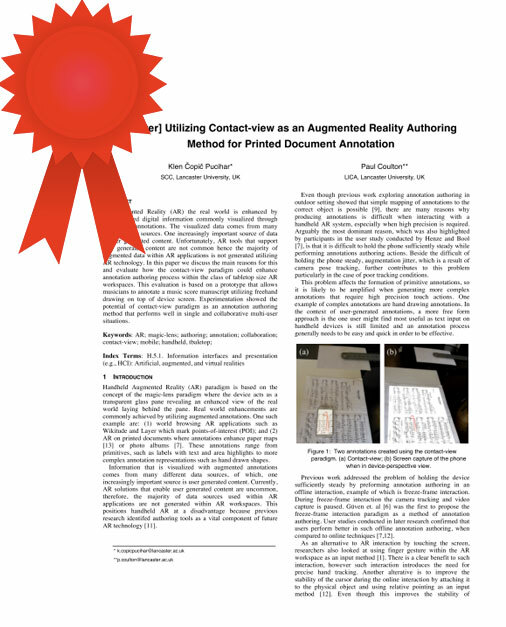 Best Poster Award at the top ranking International Symposium on Mixed and Augmented Reality ISMAR for our work "Utilizing Contact-view as an Augmented Reality Authoring Method for Printed Document Annotation" by Klen Čopič Pucihar and Paul Coulton. Team B38: Adrian Gardinar, Mark Lochrie and Klen Čopič Pucihar won two prizes on a 24 hour hack event, namely: Best Data Visualisation and the Grand Prize (community awarded) for their geo-fenced search engine. The Metre App developed by Klen Copic Pucihar won the first runner up prize at the first Maemo codding competition. The competition was worldwide and open to anyone. Initiated by Vodafone Betavine and sponsored by Forum Nokia, the WidSets Challenge 2008 was open to students from all universities, polytechnics and colleges across the world. It aims to encourage student innovation in mobile Web 2.0 technologies by providing a showcase for their ideas and working models. Lancaster University Communication Systems MSc students Klen Copic Pucihar and Lyon Laxman took first prize for their game 4 in the row - a multiplayer game whereby you can challenge, play and chat with a player anywhere in the world across the mobile network. Co-rganizer of DIST Summer Workshop: Persuasive Technologies 2015 visited by 15 participant and 2 presenters. Tweeter feed. Chair of scientific committe at Encompassing Computer Science Workshop 2015 visited by 70 participant, 6 invited speakers and 24 presenters. 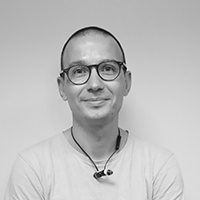 Klen Čopič Pucihar was awarded a William Ritchie Travel Grant in order to support his efforts in presenting his work at the most prestigious Human Computer Interaction conference CHI 2014. Research grant for the development of Augmented Rrality project called SID-MAR. Slovenian Human Resources Development and Scholarship Fund awarded Klen Čopič Pucihar with a 3 year PhD scholarship. Working at the Faculty of Mathematics, Natural Sciences and Information Technologies (FAMNIT). I am a member of DIST. We are a group of joung enthusiastic researchers READY to collaborate on projects related to Augmented Reality , HCI, AI and Text mining. 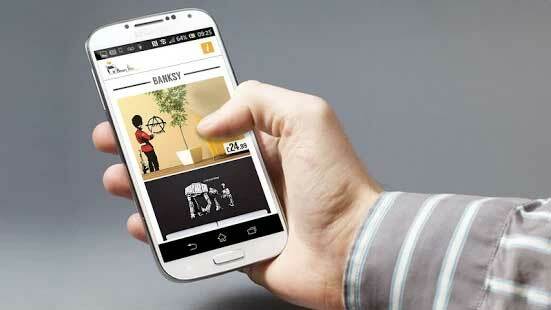 Creating a vision based Augmented Reality (AR) service for galleries and museums called Taking Artwork Home (TAH). Working in collaboration with Live at LICA Lancaster. Exploring usability issues that affect usefulness of Handheld Augmented Reality (AR) systems and providing lab support for a wide range of courses (Creative Technologies, Android Development, Mobile Game Design, 3D Animation and Game Design, Information Technologies, Operating Systems, etc.). Lead Software Developer at a start up company managing a team of three engineers. The project called CityLife included software and hardware development of a park and hire bicycle sharing system. We managed to build a working prototype, but failed to get sufficient investment for system deployment. 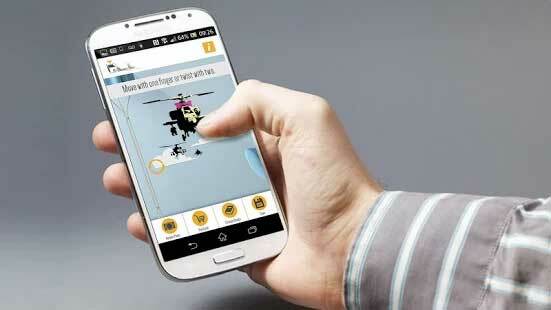 Thesis title: Designing Effective Mobile Augmented Reality Interactions. Thesis title: A context Driven Mobile Social Netwrork. Thesis title: Control of Distributed Bicycle Sheds.